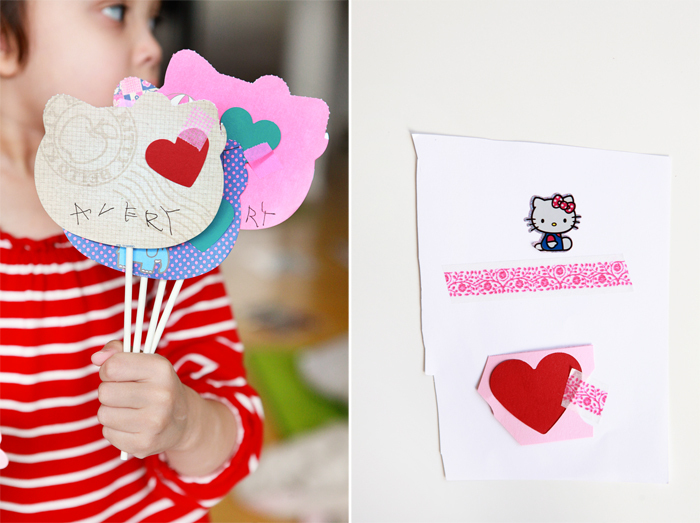 Avery's valentines for her preschool class: made with Hello Kitty die-cut scrapbook paper (purchased from Michael's awhile back), washi tape, Paper Source paper punched into hearts and lollipop sticks. I put her supplies along with stickers in an empty Bajo box--she loved bringing out her Valentine's kit when she wanted to make valentines or craft in general. Avery also made a Valentine's picture for Nate (in the last right-hand photo).